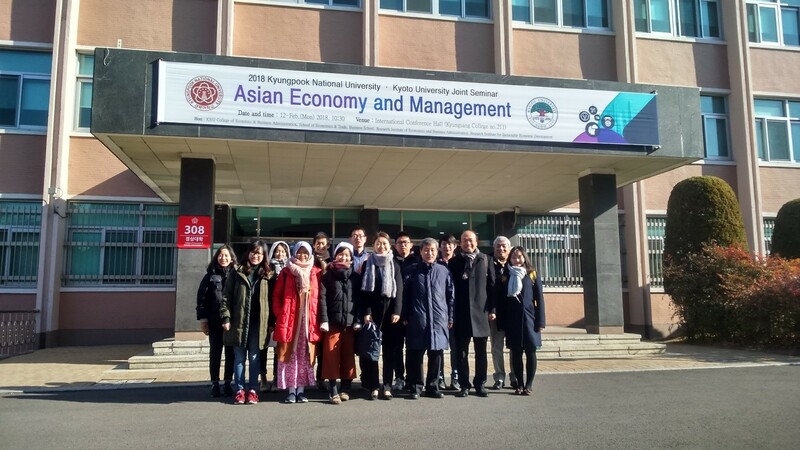 The Graduate School of Economics organized a week-long field research trip to the Republic of Korea in February 2018. The participants included eleven students in total; nine of whom were from the Graduate School of Economics’ EA programme, one was an undergraduate from the Faculty of Economics, and one a Masters’ student from the Faculty of Letters. The research trip was organized so that the participating students could see and experience first-hand the current economic, social and political situation in the Republic of Korea and gain appreciation of the course of its development and the future challenges ahead. 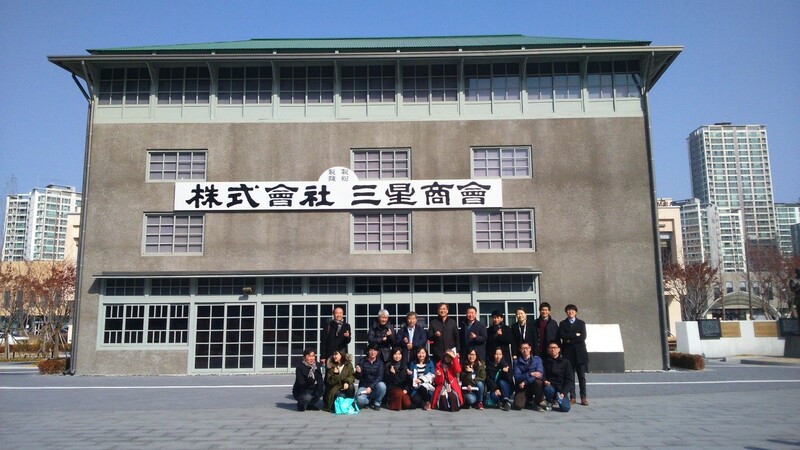 In addition, the trip aimed at further encouraging international student and academic exchange between Kyoto University and Kyungpook National University via a joint-workshop. The trip included visits to several locations in the Republic of Korea including the capital Seoul (3.5 days), Daegu city & Gumi city industrial park (3.5 days), Pusan (half day). Seoul. Students visited the National Bank of Korea Museum in order to learn about the history of currency in Korea, and the important role of monetary policy and the central bank in fostering economic development. They also visited the National Museum of Korea and Agricultural Museum where the gained an understanding of Korea’s history and culture at its place in the wider region of East Asia, as well as the past and current development of technology, practice and policy in what for most of Korean history was its main economic sector, agriculture. Students also visited the Korean National Assembly and former Seodaemun Prison memorial which gave them a sense of the current political situation on the peninsula and served as a reminder of Korea’s long struggle for independence and towards its current democratic system. Students also had the chance to visit the Gyeongbokgung Palace, explore the Myeongdong retail district, and witness the Pyeongchang Winter Olympics opening ceremony at a “Livesite” in the capital—a historical moment in which both North and South marched under the “unification flag”. Daegu. In the wonderful city of Daegu, the students and staff of Kyoto University had the pleasure of participating in a joint workshop with the College of Economics & Business Administration at Kyungpook National University (KNU), one of the exchange partners of Kyoto University. After a kind and warm welcome from the Dean Prof. Joung Hae Seo, Prof. Gyewan Moon, Prof. Na Hyung Hee and many other faculty and students, we had the absolute pleasure of a lecture by Prof. Jang Tae-Seouk about the development of the Korean economy since the Korean War, and the current issues and future prospects of the Korean economy. After this, students presented their ongoing research and obtained valuable feedback from both faculty and fellow students. The workshop lasted the majority of the day, but we still had enough time to visit the Daegu Metropolitan City Office where we had a meeting with the Deputy Mayor of Daegu, Kim Yon Chang who spoke frankly and with pride about the achievements of Daegu, its current economic strategy and the challenges it needs to overcome to build on its industrial heritage. He also gave students plenty of opportunity to ask questions about the role of regional government in the economy. During our stay in Daegu we also visited the Daegu Centre for Creative Economy & Innovation (CCEI) in order to learn about the interaction between local start-up enterprises, local and national government, and big business in Korea. The CCEI is located in central Daegu where Samsung’s former textile factories were based and now hosts a number of spaces in which start ups can gain “incubation” support and utilize retail and production space. At the centre we had the pleasure of attending a lecture by Yeon Kyuhwang, the head of CCEI, about its concept and the various kinds of support offered. We then engaged in a lively debate about the problems involved in finding a balance between providing essential funds and know-how to start ups (from Government and existing big business) and maintaining the independence of such firms. Political issues regarding the appropriate role of central vs. local government were also at the heart of the debate. Gumi. In the middle of our stay in Daegu we made a day trip to Gumi city which is home to a leading industrial complex that has won many government awards for its production facilities and contribution to exports. Here, students enjoyed an interactive experience of Samsung’s latest products at its Smart Gallery and then observed the production line of LG’s A3 TV factory which produces OLED televisions. Built in a village area under government planning in previous decades, Gumi city in some ways provides a microcosm for the Korean economic miracle. After the visits students discussed the differences in management style and business approach at LG and Samsung in dialogue with experts from KNU, such as Prof. Gyewan Moon and Kyoto University Graduate (now of KNU) Na-sensei, our own experts from KU Prof. Hiromi Shioji and Dr. Woojin Kim, as well as Mr. Taeik Kim of Daegu Metropolitan City Office. We gained an insight into the differences in Japanese and Korean business management and philosophy, and also the challenges that Korean firms have faced in recent decades in moving from the “catch-up” phase of economic development to the frontier of innovation and production of electronics and other industries. We departed the Republic of Korea from Pusan on a national holiday and so students enjoyed a half day of free time before returning to Japan. 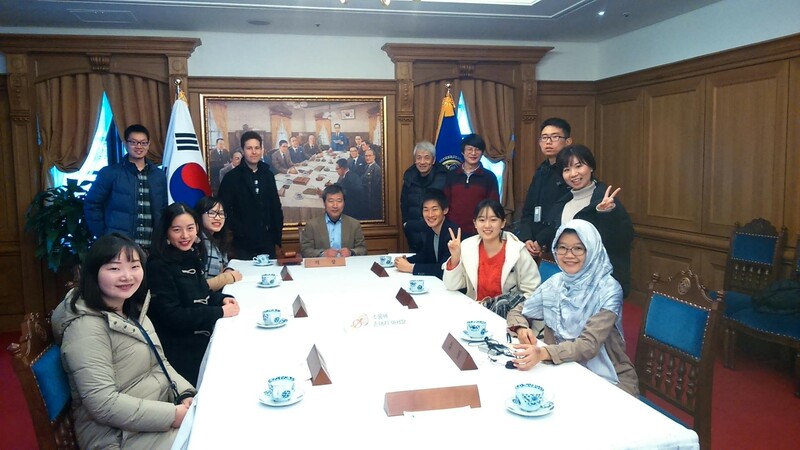 Overall, students gained valuable knowledge about Korean economic development and its relation to various social, political and historical conditions, and the also gained first-hand experience of obtaining information from onsite research visits. Besides this, many friends were made and we look forward to an active future exchange with our partners in the Republic of Korea. Our deepest gratitude to all of those who made this field research possible.